MASTER PROBLEMS Health and Wellbeing Can your heart beat forever? Can your heart beat forever? Within your chest beats a truly astonishing organ about the size of your fist—your heart. Without pause, it pumps the blood that carries life-sustaining nourishment to your billions of body cells. The forces involved in the design and construction of the heart are beyond human understanding. At conception, for example, the blueprints for the heart, as well as all other body parts, are drawn up. Amazingly, in a matter of minutes all the instructions are determined within the fertilized cell to make a new person! No scientist knows how this is done. Without observable direction, the original fertilized egg cell soon begins to divide, forming cells that are different from their predecessors. Shortly, there are many different kinds of cells that start to form into various organs. At three weeks the partly developed heart begins to beat, probably even before the mother-to-be knows that she is pregnant. What causes these heart cells, which at first form only a straight tube, to begin to contract rhythmically? “We are still a long way from finding the final answer,” admits Dr. Robert L. DeHaan who has been studying the subject for years. What is known, however, is fascinating. Consider, for example, this beat, or contraction, of the heart that forces blood out to the rest of the body. Do you know what causes the heartbeat? Responsible is the amazing ability of the heart to generate electrical impulses. Thus, if provided with oxygen and kept from drying out, the heart will continue to beat for a while even after it is removed from the body. Within the heart there is a complex system for generating and regulating electrical impulses. This remarkable control system is made up of special cells concentrated in groups in different parts of the heart. A principal part of this system is a tiny comma-shaped structure called the sinoatrial node, or S-A node, a special tissue that is a cross between heart muscle and nerve cells. This is the heart’s primary pacemaker, and so has been called the “spark plug” for the heart. Here a regular series of electrical pulses are generated that travel through the heart and trigger its beat. The basic rate of contraction generated by these sinoatrial node cells is about 70 beats per minute, the normal heart rate of most adults. Another part of the heart’s control system is the atrioventricular node, or A-V node. The electrical pulses from the sinoatrial node reach this part, where they are properly timed and regulated to assure good coordination of the heart’s pumping action. Then from here these pulses move swiftly through other specialized conduction tissues, including one called the bundle of His, to the rest of the heart. The atrioventricular node also has an inherent rhythm—about 50 beats per minute—somewhat slower than the sinoatrial node. The impulse-generating function of this structure, however, is not utilized under normal conditions. But in an emergency, if the sinoatrial node fails, the atrioventricular node can serve as a reserve pacemaker. In addition, the bundle of His, along with yet other specialized conduction tissues, can serve as a last line of defense. They, too, can initiate slow contractions of the heart, about 30 to 40 beats per minute, a rate that may sustain life. How the system meets body needs? If you run to catch a bus, climb stairs, or exercise in a similarly strenuous way, the heart rate must increase to meet the body’s need for more nourishment. What tells the heart to speed up? How does it know the rate at which to beat to meet various body needs? Signals coming through nerve connections from other parts of the body are particularly responsible. During exercise, for example, your muscles need more oxygen; so they take an increased supply from the blood. The decreased oxygen level of the blood triggers receptors in the arteries to send nerve signals to the brain. Through nerve impulses, the brain, in turn, signals the heart to beat faster, thus providing more oxygen-carrying blood for your muscles. However, the heart is not dependent solely on such nerve connections, as illustrated in the case of heart transplants. In such operations the vagal and sympathetic nerve systems are severed, yet the transplanted heart continues to some extent to regulate its beat in response to the changing needs of the body. 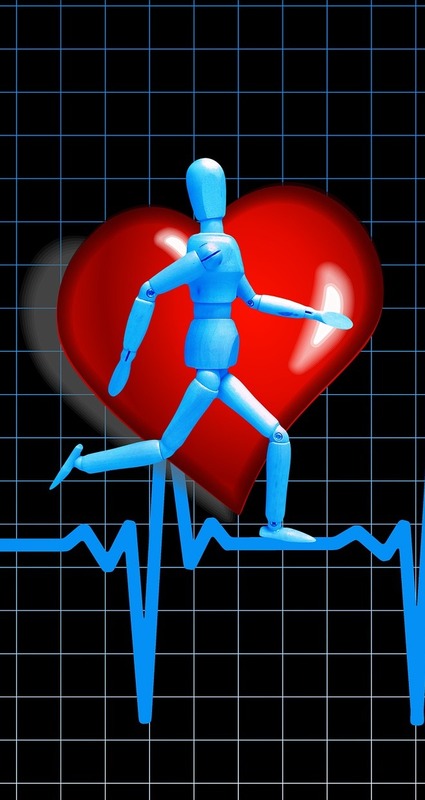 The heart is able to respond directly to chemicals, such as adrenaline, received through the blood stream, and thereby “knows” when to speed up or slow down. Truly, it is wondrous how the heart is designed to keep just the right amount of blood flowing through the body to meet its changing needs! Amazing, too, are the many “backup” systems that can take over and compensate in emergencies. A look at the heart’s tremendous capacity for work will no doubt astonish you further. An adult body contains some six quarts of blood, and about 60,000 miles (96,500 kilometers) of blood vessels, including tiny capillaries. At its normal rate of about 70 beats per minute, the heart will pump some six quarts (6 liters) of blood every minute. Your heart pushes your entire blood supply through your body in less than 60 seconds! Under ordinary conditions, it pumps up to 10 tons of blood through your vessels daily. Yet, at this rate, it is not even working very hard. If yours is a physically fit heart, one trained by regular exercise, it may be capable of pumping as many as 30 quarts of blood or more a minute. At that rate it is pushing your entire blood supply through your body about every 10 seconds! Yes, your heart pumps so steadily and powerfully that every day it can push your blood through several thousand complete circuits of your body! Were humans originally meant to live for only 70 to 80 years or so and then die? Could the heart beat indefinitely? The heart, as well as the rest of the body, is designed quite differently from any machine made by men. Machines of human design are made with permanent parts, which, of course, eventually wear out. The human body, however, differs considerably in its makeup. Thus, regardless of whether a person lives to 20 years of age, 80 years, 800 years, or forever, most of the materials in his body would be less than a year old. Cell duplication theoretically should keep the body alive forever. Medical researchers have, at times, drawn attention to this potential, noting that it is easier to explain why humans should live forever than why they should die. Nevertheless, as time passes, the heart, along with the rest of the body, fails to maintain its ability systematically to replace its cells before they become defective and die. Cell biologists have many theories. But they do not really know for sure. Obviously, something eventually goes wrong in the inner workings of cells, and those wearing out and dying are not always replaced by new ones through cell division. So humans grow old and die. If a correction could be made, and the right balance in cell replacement and renewal was maintained, humans could live forever. However, humans are yet able to repair the malfunction.